Hey everyone! Listen up! 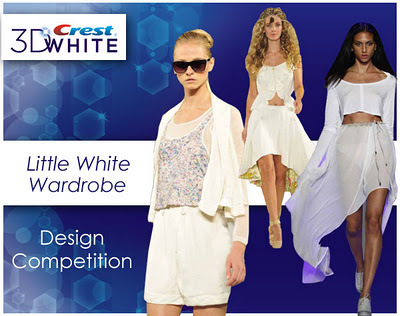 Crest 3D White and Gen Art are launching the ‘Little White Wardrobe Design Competition that challenges emerging fashion designers to create a glamoros and radiant capsule collection inspired by the must-have beauty accessory for New York Fashion Week, Crest 3D White. The grand prize? One designer will receive the stand-out moment of a lifetime to debut their capsule collection on the runway as part of the Gen Art New Garde fashion show …a first in Gen Art history! Additionally, three lucky finalists will have their sketches displayed onsite at the event in a special installation, allowing for industry exposure. Crest 3D White, #1 whitening brand recognized by top beauty magazine editors, is bringing bright smiles to the runway by partnering with Gen Art for the upcoming Gen Art New Garde event in February (date TBA) surrounding New York Fashion Week 2012. Aspiring designers can find more information about the competition by visiting www.genart.org/littlewhitewardrobe.The deadline to enter is January 5, 2011. For more information on Crest 3D White, visitwww.3DWhite.com. To connect socially, find Crest 3D White on Facebook (facebook.com/CrestWhitestrips) and Twitter (@Crest). Join the ‘Little White Wardrobe’ Design Competition chatter using the hashtag #3DWhiteLWW. The link to your twitter account did not work and when I searched it on Twitter it said the link did not exist - ?